T Shirts, Hoodies and More! Blog design by Sadie Olive. Logo design by Liquid Language. Open The Door To Pechanga's Closet And Things Will Never Look The Same Again. And that is a good thing! Pechanga's Closet is a wonderful place where Darlene Shinn shares her most wonderful crafties. And they really are wonderful. Once inside you will be amazed at the creativity that is bursting from every corner. Color, style and originality are the trademarks. Not only will you find it full of Doxies (inlcuding Darlene's beloved Pechanga), Cavalier King Charles Spaniels, Schnauzers and custom dogs too, but you will also find all other kinds of creatures, some real and not so real. For a little visit here is the link to her etsy shop. Those of you that have been in our booth recently have been able to see the Vintage Dannyquest that Dee has been graciously allowing us to sell for her. Since I love older handmade things this has been an enjoyable project for me. We have and still have china painted tiles and clocks, ornaments, wreaths, and head studies in many breeds. The head studies are beautiful and are hard for many people to decide what to do with them. So far I have seen them made into plaques, bed finials, door knockers and blookends. Here is a sample of what the Bullmastiff Club did with one of the cold cast bronze head studies. They are going to make beautiful trophies, and no one will ever know that the head was only $10.00, that is unless they read it here. Thank you Lydia for taking this picture for us. 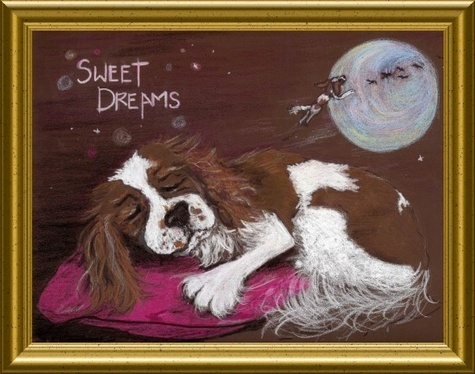 Bonne is a fantastic artist that we were lucky to meet at the Mount Palomar Kennel Club Show. While we were there she took a photo of Pickles and Olivia early in the day and immediately began to work on their portrait. Within hours we had a beautiful framed portrait that captured the spirit of our lovely ladies. If you are going to Santa Barbara Bonne can take a picture of your dog and work from that, or what she really loves to work from is candids of dogs just having fun. Best of all, she works on the portrait right at the show, so you get to take it home with you right away. And as we all know, there is nothing better than instant gratification! And What Made The Night Even Better . . .
Is that I got to pick up the drawing of Olivia by the very talented Carla Fish of Playful Pucks. We were also surprised to see that Whole Foods Market in Tustin carries her clothing line in the Whole Body Section. The t shirts were adorable and I wanted to take home more than one! Hopefully we can convince Carla that Olivia belongs on one or two! Pickles celebrates Spring in a beautiful Easter bonnet. 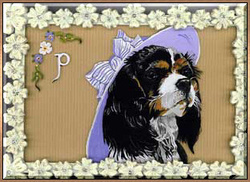 This Spring time portrait of Pickles was painted on glass by the very talented Lindalee Green. We loved it so much that we had we had her do "Seasons of Pickles" so you will be seeing more of her artwork on these pages! And be the dedicated Dog Mom that I am, I also ordered the note cards and address labels. We hope that you enjoy this portrait of Pickles and all that Spring has to offer. Which at our house includes lizard chasing, bird chasing, eating berries off of bushes and sunning yourself on the patio! We Won This Adorable Drawing Of Olivia From Playful Pucks! At Pet Expo last year we won a drawing by the very talented Carla Fish of www.playfulpucks.com. 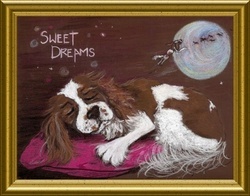 We sent her some pictures of Olivia and described her personality and she created "Sweet Dreams" for us. One of Olivia's favorite things to do is to chase birds and we were so happy that she was able to incorporate that into the drawing. Thank you so much Carla! Keeping Pet Records Online Has Never, Ever Been Easier. And It's Free. Frozen Stuffed Bones Are A Good Thing. Pet Food Recalls Keep Coming. Cat Flats! Why Didn't I Think Of That! And Just What Is Your Style? Dog House Of Course! Anatomy of a Pit Bull. There Is Still Time To Make Easter Bunny Ears! Rabbits Make Wonderful Pets, Just Say No To Them As A Gift At Easter And Any Other Time Of Year. Got Some Great Customer Service Today! Twitter Followers on Floppy, Moppy's Are Back! marksdorcel on Keeping Pet Records Online Has Never, Ever Been Easier. And It's Free. good flash games on Pet Food Recalls And Dog Treat Warnings! What You Can Do To Keep Your Pet Safe. cat food on Pet Food Recalls Keep Coming. Used caterpillar engines on Cat Flats! Why Didn't I Think Of That! healthy cat food on Pet Food Recalls Keep Coming. Small Business Logo Design on Counting Down To Valentines Day . . .
Business Logo Design on Pet Food Recalls Keep Coming. Kooldog on Need A Good Dog Bed? Liz Moe on Pet Food Recalls And Dog Treat Warnings! What You Can Do To Keep Your Pet Safe.